One of the most entertaining and amazing things we get to see here at the Bike Index is how people use Bike Index's various tools - often in unexpected ways. "Hello! 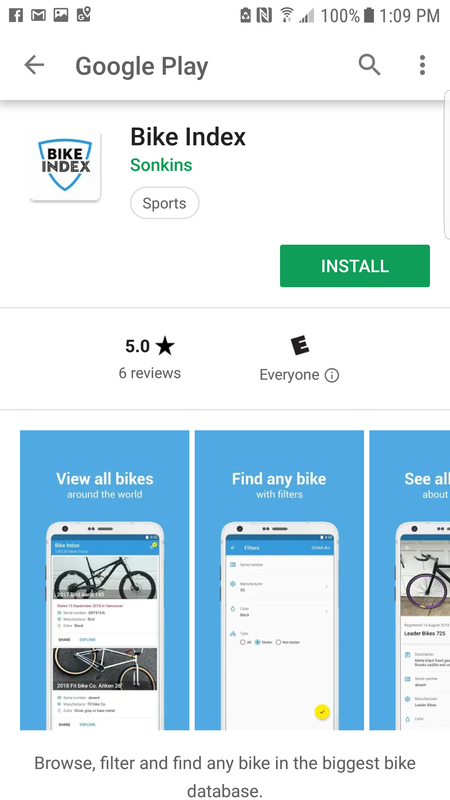 My wife (web designer) and I wanted to help you with your mission and developed the Android application Bike Index. It's free, without advertising and has links to your site. Also we are an open source project, full project code can be found here"
As we soon found out, Vlad his wife Tanya had built a Bike Index app - from scratch, all the way from Moscow, which I find quite amazing - I downloaded the app and had a look around. Yeah, wow - they built a pretty great app. Right now the app does all the basic searching by make/model/color serial etc - no advanced features like bike listing or management yet - but it works pretty smoothly. And, wow, we've never even 'met' them before! 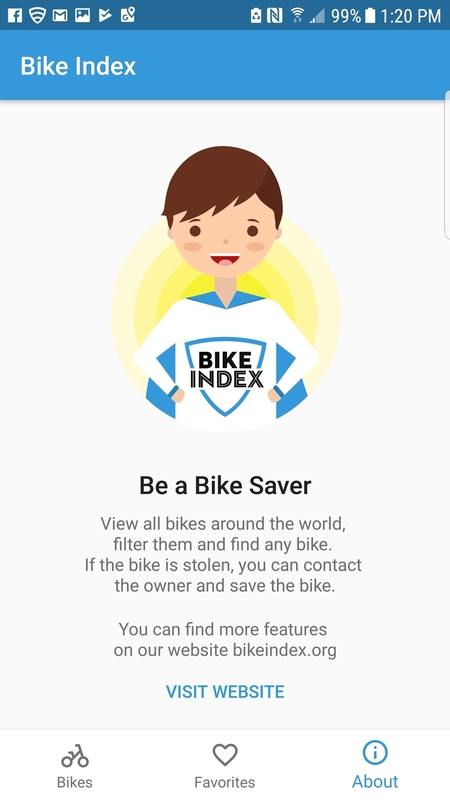 For the non-technical folks out there, Bike Index has an open API (an Application Programming Interface) that lets people 'talk' to Bike Index's database with their own code. It's what lets the Bike Index database talk to things like RAPID, LEADSOnline, Lightspeed - and now, Vlad and Tanya's Bike Index app. Bike Index is the only registration/recovery site with this kind of API access - and it's why we get wonderful surprises like this. Bike Index: How did you and your wife get started in programming and app development? Did you both study technology in school or have a technology background? Bike Index: How did you discover the Bike Index (and the Bike Index API)? Were you looking around on Github or did you find it somewhere else? Vlad: We started to look for an idea. We google it. I typed “public API list” and chose Bike Index for our main idea of application, because we saw a potential in this project. We think that it can be very useful for community of Bike Index. To be honest, our goal is to relocate to Netherlands and live there. And the first version of Bike Index application actually called an “Stolen Bikes NL” in orange colors. It primary goal was to find a stolen bikes in NL, because I read somewhere that bike theft is a big deal in Netherlands and we wanted to help. But then we thought - why to limit application to only Netherlands? Why not to expanding it world-wide so everyone can use it? It can bring a lot of benefits to people. (At this point Bike Index quickly introduced Vlad to the Against Bike Theft In The Netherlands FB group, because we think they should meet each other). Bike Index: I don't know a whole lot about Android development, can you tell me what kind of tools and programming environment you use? What kind of tools did you use to build the Bike Index app? Vlad: For coding I used Android Studio and for the design we used Photoshop and Illustrator. And of course code project is open and it’s in Github, so nothing fancy here. Bike Index: What is it like for you and your wife being developers in Moscow? Is there a pretty good 'developer' scene there? Answer: Moscow is a good place for the developers, you can earn some money and there a lot of big companies here. But we want to relocate to the Netherlands and try to live in foreign country and work in some international company. If you have an Android phone, you can check out the app here. And, if you're in the Netherlands (or not!) and you are looking for an awesome dev who cares about bike thefts - drop Vlad and Tanya a line!